The Only Time You'll Ever Fire A Minigun And Not Destroy Everything Around You | OhGizmo! This is a toy, and it’s a pretty serious one. Matter of fact, it’s about as serious a toy as we’ve ever seen, since you’re going to have to fork out $3,900 to own it. For that amount though, you get the Echo1 M134 MiniGun Airsoft Machine Gun, which will launch an astonishing stream of plastic pellets at a rate of “several thousand rounds per minute”. 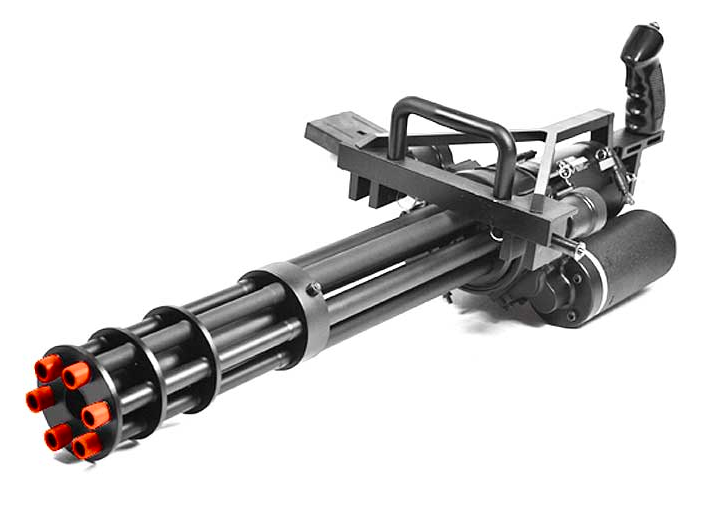 This battery-powered, hip-mounted, 35-lbs monstrosity fires its rounds at 390fps, fast enough to pierce through glass tubing (as per the video). A 1,700 round magazine ensures you don’t run out of ammo in a split second, and it comes with two interchangeable barrels of differing lengths. The whole kit ships in a wooden crate and comes with a certificate of authenticity.